The 1st* Talika anti-aging mask in biocellulose. It visibly plumps and brightens the skin. His secret? Biocellulose, an ultra-pure nanofiber derived from the enzymatic fermentation of coconut water, whose 3D structure retains a high concentration of key ingredients. Twice a week on cleansed skin if used as treatment or whenever needed! Remove the 2 protective films. Apply the mask and leave it up to 30min. 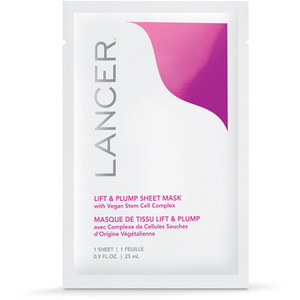 Take off the mask and gently massage the skin to help the excess serum penetrate into the skin. Aqua (Water/Eau), Butylene Glycol, Glycerin, Bambusa Textilis Stem Extract, Citrus Grandis (Grapefruit) Seed Extract, Pinus Palustris Leaf Extract, Polyacrylate-13, Polyisobutene, Caprylyl Glycol, Alcohol, Ethylhexylglycerin, Parfum (Fragrance), Phenoxyethanol, 1,2-Hexanediol, Polysorbate 20, Sorbitan Isostearate, Sodium Hyaluronate, Hydrolyzed Collagen, Citrullus Lanatus (Watermelon) Fruit Extract, Citrulline, Disodium Edta, Sodium Benzoate, Potassium Sorbate, Limonene, Linalool.